This past weekend, a club that a couple of friends and I started in Connecticut, girlsCAN Football (GCF) won our first State Cup, at U16, in our first year as a club. We had players from all of our teams there, right down to the little guys cheering them on, and it was a big thrill to see the girls win the trophy. 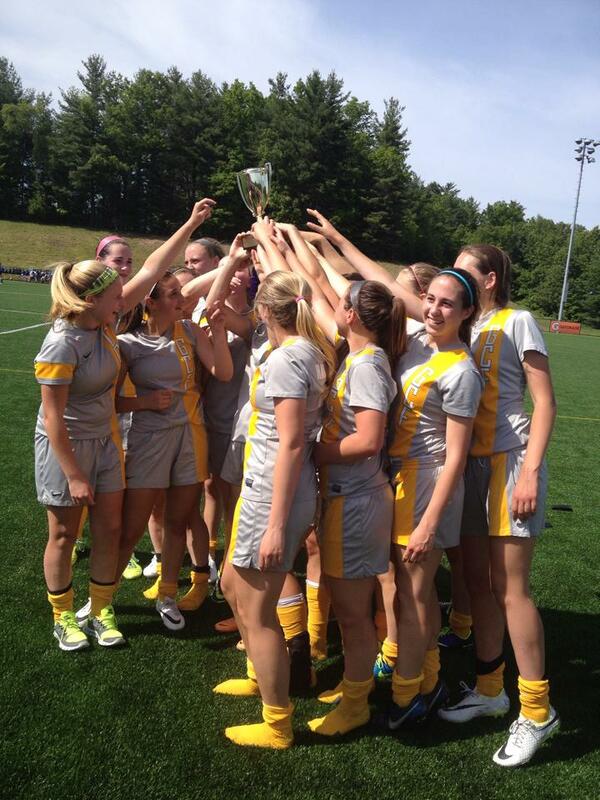 Yet for me at least, the best part of winning the State Cup had nothing to do with winning the State Cup. But first let me back up. Hi Ciara. Hope that you are doing well. Was in the Dunbar area and drove by one of the soccer fields on 16th Avenue. Reminded me of Vancouver United. A gush of soccer memories, all pleasant, came back to me. I started to think of my favorite soccer memories, and the first one that came to mind involved you. You may recall, there was a game (sorry I cannot remember the opponent) where we had a penalty shot. It would have won the game for us, and you missed. The devastated look on your face still sits in my mind. The two practices we had the following week at Kensington Park were some of the most tense practices I had seen you have. I think we may have been playing the Golden Ears team, with Karina Leblanc, Ashley Newport, Amy Folka, and Chrissy Kogler. We had a chance of a penalty shot, and I remember turning to Ryan and Steve saying “we have to give it to Ciara” and I did not care if we scored or not, but you needed to have it. I am not sure what went through your head, but I am sure it was a lot. All I know is that you scored, and the look on your face is just as entrenched in my mind as the look when you missed the previous week…. As I look back now as a coach and reflect on the coaches that I had growing up, although most of them had never played at a high level, what is so apparent to me and something I took for granted at the time, was that they provided an environment that had little to do with soccer. Rather it was about growing my confidence and my teammates’ confidence. It was a place that we were nurtured first and foremost as people, and secondly as players. And it’s a place that I’m pretty sure I loved being at as much as I loved the game itself, as one became so intertwined with the other. In retrospect as I talked to many of my teammates as we were in our 20’s, we revealed some extremely hard things that some of us had going on at home, and yet these coaches that we were so lucky to have, provided a happy place for us, a place where we were loved, where they believed in us and rooted for us, and where it was always about the team first. He had no high level soccer experience. But that being said, it shows the importance of a good environment as this coach who cared about me enough to notice how much it upset me not to make that PK and who threw away his care of the score in a big game to allow me a chance to rectify my mistake, had 4 players from our Provincial team go on to the top international level of the women’s game. Randee Hermus, was one of the most capped players in Canadian history before she retired after the Beijing Olympics, Roxanne Chow, played at Wake Forest at for the Canadian U20 team, myself with Ireland, and Karina Leblanc who is still currently with Canada and playing also in the NWSL all played under this coach and ones like him who were far better people than they were experts of the game. I think I speak for all of us, when I say how important that foundation that we had when we were young from coaches such as this one who wrote me, and all the fantastic values that we were taught, propelled us to all achieve things in our career both on and off the field as the group have all gone on to accomplish some incredible things. Now back to those GCF U16’s that won the State Cup this weekend. I look back at the win, and it makes me choke up. Not because we won, although winning is always nice. But when I look back at the week, I’ll think of how it warmed my heart, when, for the first time, I saw the personality of a player shine through on the Wednesday night at training before the big game. Always reserved and shy, she came off the field laughing and joking. She came to us beaten down from her old club and I have had a soft spot for her after I heard she has a member of her immediate family that is sick, something I know can be a lonely thing to deal with as a teenager. She scored the winning goal and had an amazing assist in the game in the 2-1 win. But it’s her smile and how carefree and happy on Wednesday night she seemed, that I’ll remember most. Another player, who also came into our program discarded from another team, when I asked her a couple of months ago, where she wanted to go to college, she looked at me completely serious and told me she hadn’t thought about it because she didn’t think she was good enough. She had a huge game for us at center midfield, and has been playing like a different person since she now is resonating confidence and belief in her ability after a long year of putting the work in. After the game, as I was just standing there, basking in these thoughts, another parent came over to me and asked if she could speak to me. I felt like a kid when the first thing I thought of was that I was in trouble. But she just wanted to tell me how much she appreciated that we had reached out and invited her daughter to be on the team, and how she’s seen her daughter change as a person with the confidence our program has given her. Perhaps overwhelmed already in my own thoughts, I think I caught this poor woman off guard when I started to cry, trying to explain how lucky I felt to be able to be a part of giving these kids this environment where they could find their confidence, a safe and happy place surrounded by people who care about them as people. A happy place, where their love of the game could be found, and could grow and flourish, a gift I was so fortunate enough to be given by coaches like my dear Ajay, who wrote me such a kind email so many years later. I’m pretty sure when I look back to our first State Cup win as a club, that I’ll remember that smile, where a personality finally felt comfortable to shine through, and a monster performance from a kid that didn’t think she was good enough a few months ago, that both meant so much more than a gold shiny trophy ever could.